Our family has been so blessed with the presence of Andy. We welcomed our first child into the world on September 23, 2000 with a full head of black hair and weighing in at 9 pounds 8 ounces. Because Andy was our first child, we weren’t sure what to expect as far as development. I had chosen to breastfeed, but Andy made it very clear that this was not for him – even stumping the lactation consultant. We figured he couldn’t breathe well and fed him breast milk from a bottle. We knew we were lucky when Andy was so happy to be left to himself, not only as a baby, but also as a toddler. Having worked with Autistic adults in the past, I thought I recognized some behaviors in Andy that were not usual in a typically developing child. We were reassured by friends, speech therapists and pediatricians that shaking hands and lining up toys are perfectly normal behaviors for children under one year of age. Before Andy turned 2, he began naming his letters and recognizing them in any setting. He knew his numbers to 12 and knew all shapes, including the octagon. Yet he only spoke a few words such as “miggit” for milk. He started with a speech therapist from ECI at 15 months. While playing with her I noticed he would blink his eyes and scrunch up his whole face. I asked if it was a tic and she said it seemed more like a game because we would snicker when he did it. At about 2 ½ years Andy began saying more words and used Echolalia to answer questions. He always insisted on listening to one song over and over and he would “sing” along. His pitch has always been amazing. The first time Andy answered a question in his own words was after he turned 3. At 3, ECI ended their services with Andy and we were instructed that the school district would deem him on target and would not place him in their services. Andy was a head banger right away. He would find a sharp corner or piece of ground and test it slowly before he would ram him head at it full speed. If he didn’t cry, he’d do it again harder. He never really bonded with his mommy and shrunk away from touch quite often. His pediatrician diagnosed him with Sensory Integration Disorder and we began treatment for a short time, until money ran out. Andy’s behavior was explosive and he would have meltdowns lasting over an hour. Once he started screaming and biting himself, there was nothing that could calm him down. His speech was greatly improving by 3 ½ years, but socially he was still not appropriate in his speech and behavior. I took him to the Coppell School District to see if he qualified for speech services and the evaluator asked if she could put together a team to evaluate him farther. I asked her if she suspected Autism and she said that this would be what the evaluation would determine. The diagnosis came back… severely autistic. I knew instantly this wasn’t right – if autistic – Andy has a very mild case. 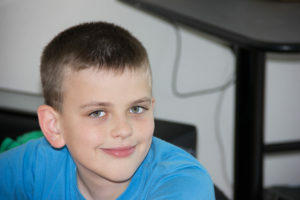 It was explained that Andy exhibits all of the symptoms of autism- so regardless of the degree of these symptoms, the amount he did exhibit classified him as severe. He was placed in the Preschool Program for Children with Disabilities (PPCD) classroom with the school district and showed improvement immediately. I then took Andy to a Developmental Pediatrician and he was diagnosed with mild autism. Even with a diagnosis it seemed there were few, if any, resources to help us teach Andy proper social behavior and calming techniques. As Andy became aggressive to others we knew we needed a behavioral therapist. I had a number of people show me an article in the newspaper about Tracy Woodall and her foundation – The Brent Woodall Foundation for Exceptional Children. Our regular pediatrician also recommended this program and we were accepted in shortly after. Tracy, Carley and Carmen came to our house and while Tracy spoke with me, Carley, Carmen, and later Irina worked with Andy in the other room to evaluate his skills. Tracy explained to me why some of his behaviors were useful to him and helped us set up a behavior plan, in the form of a chart, where we rewarded Andy for behaving appropriately in difficult situations. Transitions were especially difficult for Andy and this chart addressed that. She taught us to focus on the positive and not to use negative phrases, which only made Andy angry. The plan worked instantly and Andy’s behavior improved, along with our understanding of Andy’s thought process. Penny came to administer the WPPSI, which was helpful as we realize Andy is right there where his peers are in most areas. The Foundation has helped us better understand the school system and we’ve been empowered with that knowledge. We are very fortunate that Andy’s case is so mild, but I know these improvements in behavior have come as a direct result of Tracy and her staff working with Andy and our family on ways to better handle stressful situations. Last month Andy’s Special Education teacher with the PPCD program informed me that Andy will be placed in regular Kindergarten next year with only minor special education support, assuming there is no regression seen throughout this school year. Andy is on his way to leading a normal and very fulfilling life.